After years of intrigue, speculation and envy, I’ve finally found the excuse I need to give fat bikes a proper whirl. Daniel has sold me his frameset and rims, we’re doing a Rohloff swap, and I’m pillaging what remnants I can from the Ogre – seat post, saddle, bars etc – to finish the build. I’m buying his spare tyre and tubes too, and he’ll ship the leftovers of my faithful Ogre back home. I’m stoked, to say the very least. As for Daniel – a kindred bike nerd with a similar penchant for trying new bikes – his plans revolve around an ECR in the near future. As much as my Ogre has delighted me over the last couple of years, the opportunity has come up to try something new… and I’m all about that. Most likely, 29+ (a la ECR or Krampus), would be almost ideal for the kind of backcountry riding I enjoy, and less of a commitment when the going gets paved. But for international travel, there’s also a definite appeal in running the omnipresent 26in wheel size, given its extra inherent strength, and the ease of sourcing replacement tyres – in a pinch, downhill rubber (of which there is ample in South America) will work fine on the 65mm rims I’ll be running. Going fat won’t be without its concerns though. Tyre wear, tear and replacement costs (considerably more than their skinnier counterparts) will be on my mind. I’ll need to figure out a good location to have my next set sent out, somewhere down the road. 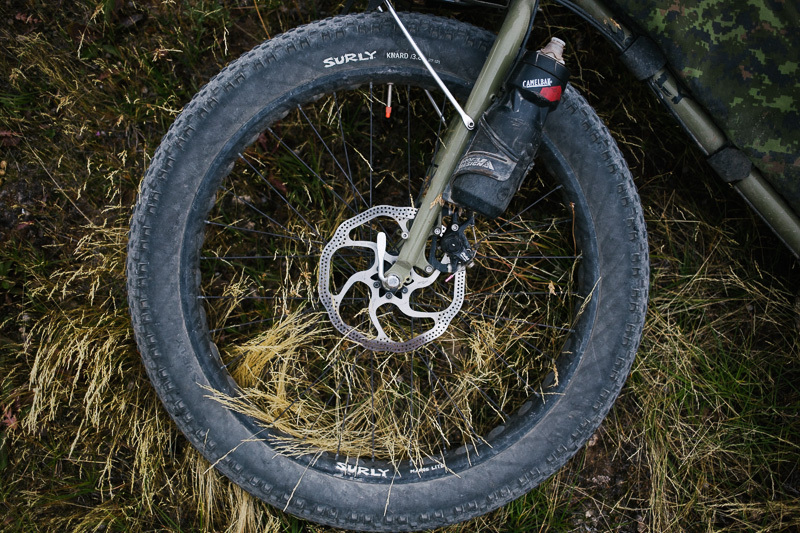 These issues aside, a few day’s test riding here in Chile have quickly convinced me that fat bikes are completely in their element, over even the most corrugated Patagonian ripio I can unearth. Further north, Kurt’s incredible travels in Bolivia have underlined how effective they are across the sandy trails of the Altiplano. As to what likes between, we’ll have to see. I’m excited to find out, and excited to see where a fat bike can take me. As for my initial impressions… from here on, I expect the vagaries of road quality to be no longer an issue or excuse – it will simply be a case of tweaking tyre pressure and riding. Certainly, the level of rider comfort is simply astonishing. 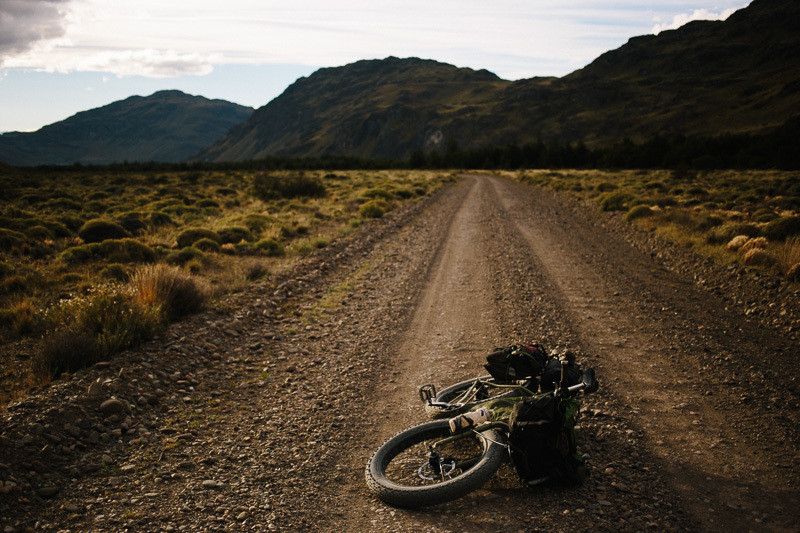 The feeling of grip is extraordinary – rocks, deep gravel, washboard, whatever. And above all, it’s such FUN! Given the extra heft, I won’t necessarily be the fastest on the road – but having my speed capped is, for me at least, no bad thing. I’m under no illusion that such bikes are optimal for many of the bike tours undertaken in Latin America. But for the kind I always aspire to do – namely, dirt, and off the beaten track – I’m hoping it will open up a whole new wealth of possibilities. Without further ado, meet La Poderosa – The Mighty One – named after Che’s 1939 Norton motorbike, on which he travelled across this continent. Fatties Fit Fine. 3.8 inches of tyre width, in this case, run at less than 10psi. That’s seriously squishy. 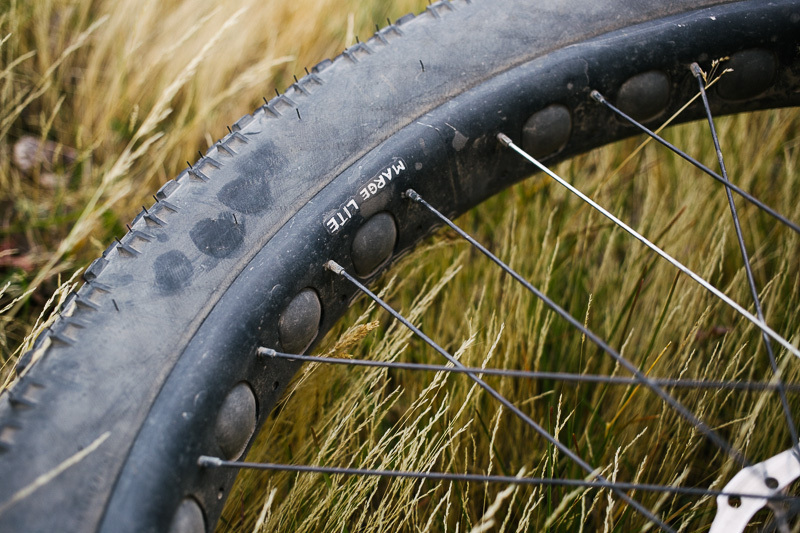 Fat bikes eat ripio for breakfast and spit out gravel like a bad taste. I’m excited too to try a 22in frame. My 20in Ogre has has worked well for mountain biking, but I’ve come to realise I prefer a larger frame for touring. The fit appears to be spot on. I’ll inherit Daniel’s Porcelain Rocket framepack. Wider than a non-fat bike, it will easily gulp down my Macbook Air, which is a welcome perk. I’m hopeful too that fat tyres will provide more protection all round for delicate electronic equipment. Up front, my Nitto rack and Carradice saddlebag find a happy home without need for modification. Bag carrying duties will be carried out by an Old Man Mountain Pugs-specific rear rack. It’s not as stiff as my Tubus Vega; hopefully it will last the distance. Large Marge Lites are an eye popping 65mm wide. In a pinch, they’ll take a 2.3in tyre – which, incidentally, is a good reason not to be tempted by anything wider for long distance travel. As these rims are only single-walled, I’ll be keeping a beading eye on how they’re faring – I’m hoping all that extra air cushion provided by the fat tyres will help coset them. I’m swapping my Son 28 dynamo hub for the same model, albeit in a wider 135mm spacing to suit the Pug’s fork. As previously, the framebag will house my SInewave Revolution and USB gadgets, charging as I pedal. … and a dinner plate-sized 200m rotor front. This, accentuated by the neglected cables on the Ogre’s brakes, has made an incredible difference to my stopping power. Thanks Daniel for making it happen! Go say hi and talk fat bikes with him at Montevelo, in Oakland, California. 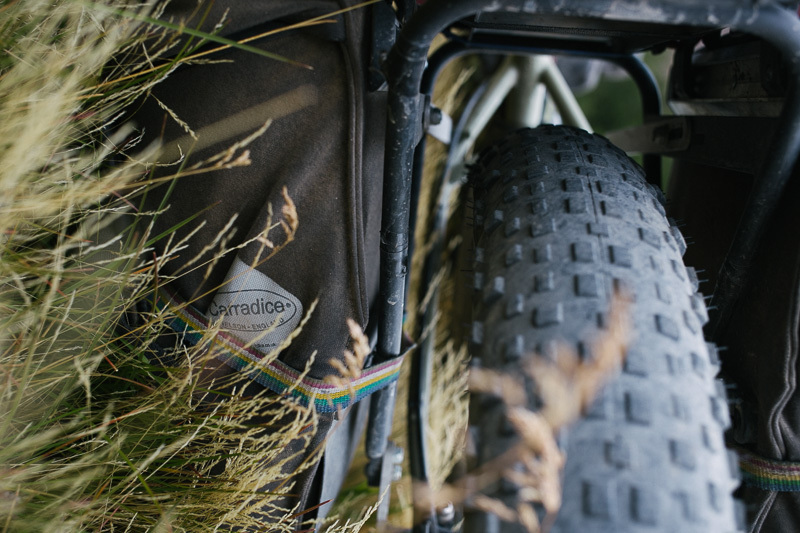 If you would like to keep up with where I am between blog posts, I try and keep my While Out Riding facebook page regularly updated, along with posting extra photos (and from now on, fat bike cogitations). You can find it here. Yeah… I guess I was hatching a plan pretty much the day after Daniel arrived (-: Rode the ‘worst’ section of ripio yesterday, a detour up to Paso Roballos – and it was the best ride so far! Booyah! Happy B-Day and tons of fun with the new ride! Thumbs up to Daniel, nice build. It’s an awesome build. The fit is perfect, and I’m really liking the 180mm OD cranks too. I feel, just a little, invincible!! Sorry if this seems a little obsessive! Congrats, buddy… that didn’t take long. That beast definitely suits you! I’ve forgotten my inside leg measurement. But – I’m 6’1″, with longer legs than average. As such, I fall between two sizes. A large fits fine, and I like the way it handles. But I also need to run a 400mm seat post, with lots of exposed mast. It just looks a bit small. Since the effective top tube measurement only increases very slightly between L and XL, the XL frame gives me more framebag space, with a minimal difference in reach that I can easily make up in stem length/seat rail position. Top tube clearance is fine. And the fork steerer is left uncut, which works out to be a comfortable height for the handlebars. 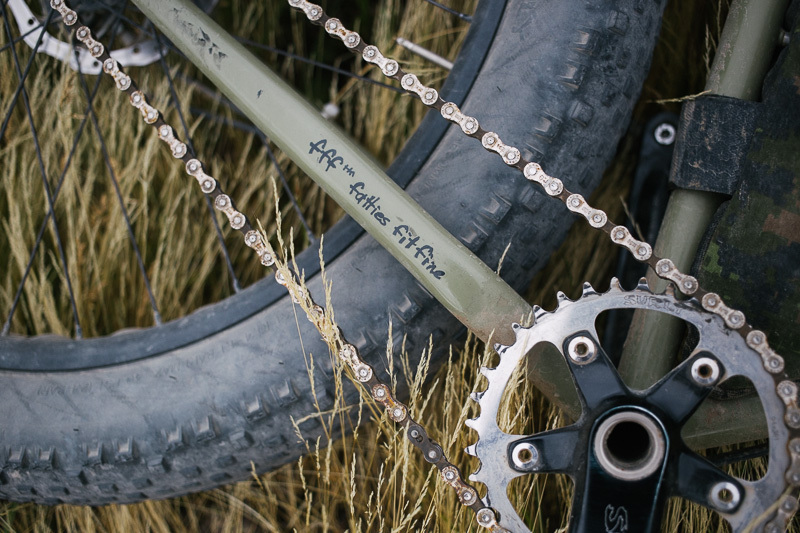 I’ve always ridden with 175mm cranks, but Daniel specced his bike with 180mm Surly ODs, and they feel good to me. Great looking bike. Have fun bulldozing over everything in sight! Love the color combo with the Porcelain Rocket bag. Scott is a master constructor, and Daniel has done a great job pulling the bike together. Sounds like you’re dialing in the fit well. Like you, I’m between sizes, and though it would be great to have a half step size in between, I think you’ll like the XL. My legs aren’t as long as yours, but I’ve much appreciated swapping my size L Pugsley frame for an XL. I have much less seatpost exposed, and if anything, I like having a slightly longer top tube. Matthew, if it is of any help, I’m a hair under 6’2″ in bare feet and have a PBH of 89.5cm (http://www.rivbike.com/kb_results.asp?ID=39). 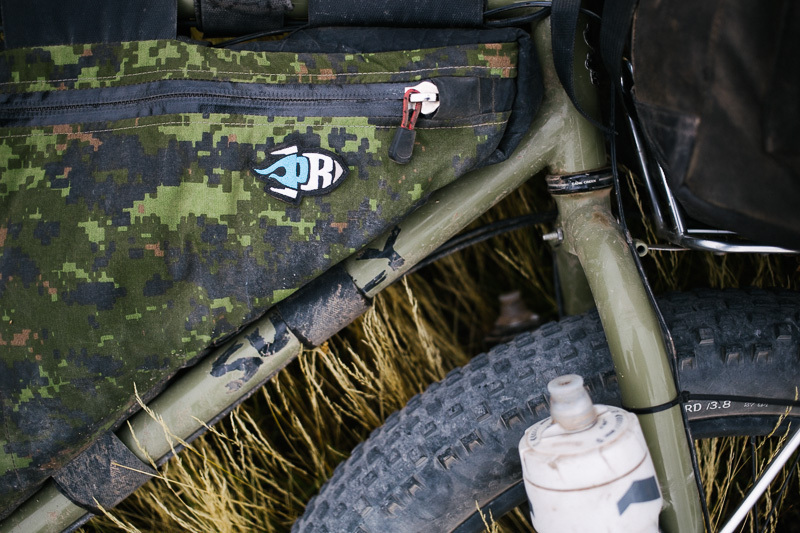 Digital camo is a little too military for me normally, but I must agree – the bike looks great!!! And, the frame bag is simply enormous. Swallows my computer and plenty more besides. A nudge forward on the seat (maybe an inline post in the future) has done the trick. Perhaps a stem one centimetre shorter would be good too, but that can wait. 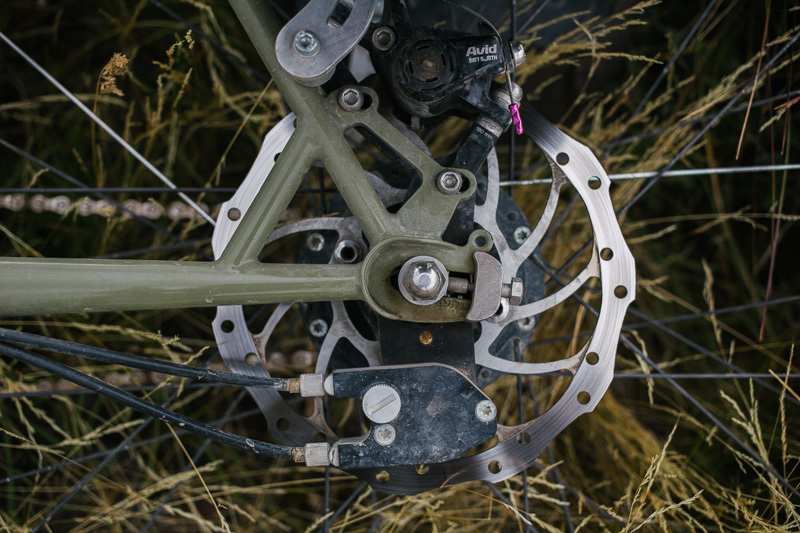 L works great for mountain biking, but for this bike, XL feels just right. I forgot to say thanks to you both for replying last year. Went for a Large ECR, with a layback seatpost. Fit is amazing – it’s like riding a very comfortable tank compared to my Steamroller. Opposite ends of the Surly spectrum! Congrats on the bike swap. Sounds appropriate and exciting. Interesting that you’re going up in frame size but it also makes sense. I imagine for the riding you’re doing now, comfort takes precedent over standover height. I guess if you go with a tad shorter stem, it’s really not an issue. And you can get the bars higher. Looking forward to wear you and the Pugs go. The XL sounds big, but fits great. Also, I ride with a handlebar with plenty of sweep. All I’ve had to do is nudge forward the saddle on its rails. On my 20in Ogre, it was at its limit. That’s hilarious. Have a look at the Pug I’m building up. Look similar? It isn’t ridable yet but hopefully in a week it should be. I’m using an Alfine 8 on the back and would love to get a SON 28 135 mm for the front, except look at the price… For now my old XT hub will have to do. Here is a shot of the front “rack” I made out of bending 3/8″ aluminum with a propane torch, then drilling holes at the bottom to bolt it on. There isn’t much metal left after the holes were drilled so I think it may crack at some point. So I will probably redo it and just curl the rod around at the end to make an eye that I can bolt through (see third photo). I like this front rack, it’s super light and I can strap big but light items to it vertically, butting up against the water bottles. The mattress goes on one side and the sleeping bag on the other, and something else can go on top. Here is a shot of the back with the other aluminum rod that provides more bracing in addition to the front Sherpa rack I put on the rear (it fits perfectly with the offset if one leg is on the inside of the brazeon and the other on the outside). Also I will put Extrawheel trailer mount nuts on this bolt. The axle ones won’t work with the Alfine because it is a solid axle and there isn’t enough room for spacers to un-offset the offset. My Baja trip was great, I went on the Mukluk I sold my friend in California. 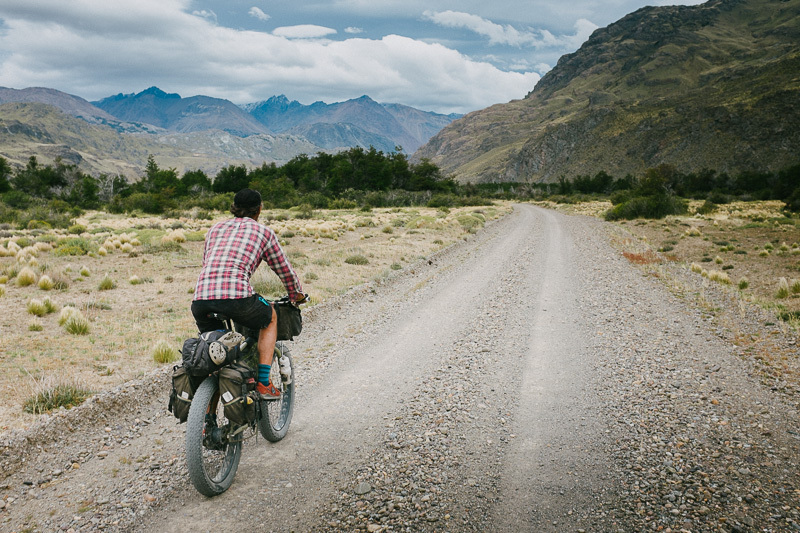 Things always seem to work out… Man those fat tires love to rip up the deep sandy roads. I hauled 22 l of water in the trailer, which lasted a week. Happy birthday, Cass. Looking forward to seeing Pugsley pics from ’round the world. 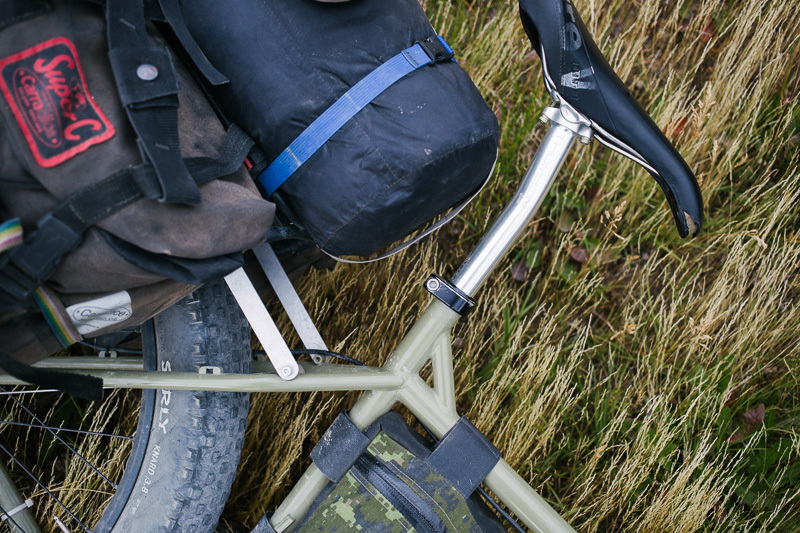 I think you’ll find it to be a very comfortable bike for trail and offroad travel. I’m missing it already!! Looking forward to the new ECR frame set though. Ride that pugs hard! Looking forward to Mongolia fat biking with you !?! Hey Cass I put up a comment here with photos but I don’t see it so I guess it got rejected. Welcome to the fat and Pugsley club. I figured it was just a matter of time. Welcome to the world of Fat. Once you are here you can’t go back. I am absolutely convinced that for a single ‘go anywhere’ bike, my Muk is the beast. I just wish I could put a Rohloff on it. Have fun, I look forward to following your travels!! Glenn, I think you can put a Rohloff on a Mukluk. You can get a special Alternator dropout plate and a spacer. I haven’t tried it myself but I would presume they’d only make a Rohloff-specific Alternator plate if you could actually use it! Congratulations! The Pugs is such a great bike, a true jack of all trades as it also makes a great riding 29er. Couldn’t imagine a better birthday present. Nice! I’d trade my surly nice rack for your vega if it would fit my ecr (knards on velocity duallies). I’m a few days behind you though. In puerto rio tranquilo. Be great if we bump into each other on the road. I’m in Tortel, planning to get the Saturday ferry. Then will hang out in Chaiten for a bit. Btw, the side trip to Paso Roballos is a great one – one of my favourite bits so far. You can ride up towards the border, then probably hitch a ride back. No fences, just open space! We’re taking our sweet time in this beautiful place! So, I doubt we’ll ever catch up. But, I’ve heard rumour that if you can get a boat across Lago Viedma there is incredible hiking along the eastern edge of the mountains, through open ground, as far as Lago Argentino. Then another boat? This has me wondering if it would be bikepackable. You should pioneer the route so that by the time we get there you’ll be able to tell us whether it’s reasonable on a bike. It’s pretty cool. If you like bikes? Nice! Love the setup with the Rohloff! That’s my next upgrade to my Pug. 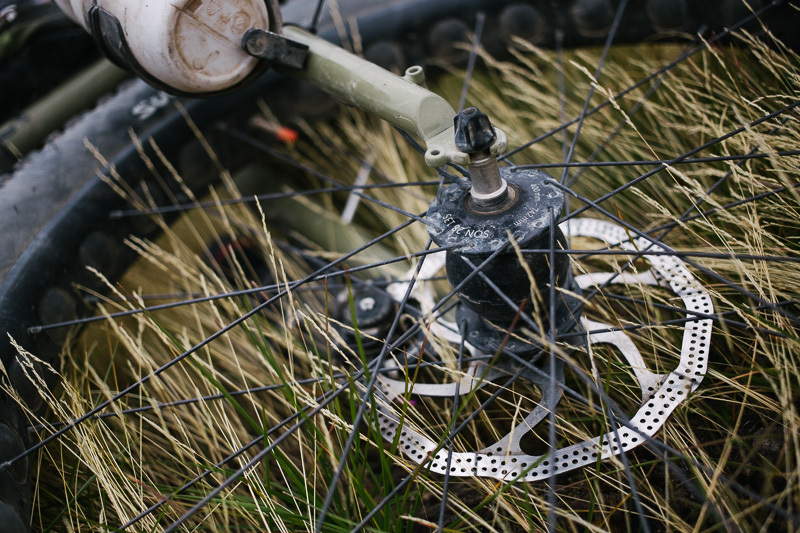 No need to worry about the OMM rack … no need to worry about the Lite rims. 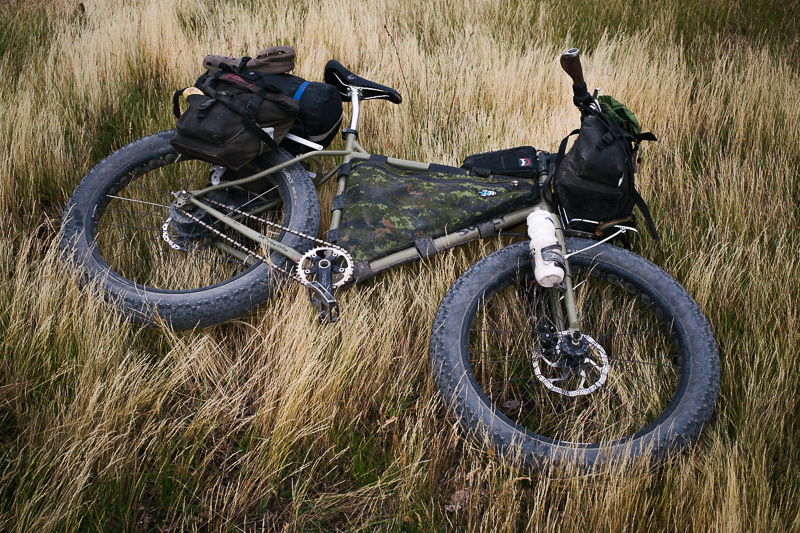 I put both thru the paces on my Great Divide run last summer (northbound, border to border) and had zero mechanicals with the whole rig … even while carrying up to 14 liters of water in bone-dry NM. Stayed with stock 160 rotors and still had plenty of stopping power … full front/rear panniers plus frame bag and hydropack. Only issue on the whole trip was two flats. That was it. You’re golden! Enjoy every mile and every minute on your fattie!! Ah mate, I told you that Fatso’s would grab hold and finally take you by the curlies…..welcome to the world of FAT……ride safe man. It had to happen some time… Loving it! !